calexico | How's My Living? You can tell that summer is rapidly approaching, given the number of festival line-ups that are tumbling in. 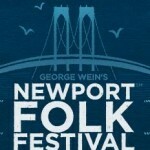 The Newport Folk Festival, in (where else) Newport, Rhode Island, has announced its lineup for its 2010 festival.